Finally! Go Pak Pictures are here! It's the InfantBows Go Pack! New Item coming in June! 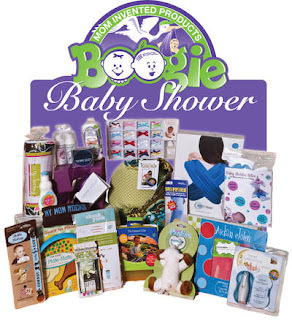 InfantBows Named in Top 200 Mom-Owned Businesses! ChicBlvd.com is now carrying our Gift Sets! Our backings are lead free and phylates free. Our ribbon suppliers are safe! InfantBows is now on Facebook! so stop by the booth and see our newest products close up. Newest changes and I am finally happy with the design. Thank goodness! The pocket that holds the InfantBow glue now has velcro behind the ribbon instead of a flap. The pocket is the entire length of the bottle too. It looks so much cleaner and more finished. I am really pleased. I am also putting together a sheet for custom fabric ideas. I have even found the next fabric choice to add. It will have pink and brown stripes. Can't wait! I am a perfectionist and "designing" a new product proved to be one of my toughest challenges yet. I have made a change since the pictures, but couldn't wait any longer to show you. I am still waiting on the materials for some new bows that will be in these. As soon as those are ready, these will be for wholesale on InfantBows.com. I will send out a not ification to all stores at that time. The latest change is to the pocket that holds the InfantBow Glue. The top of the pocket with the ribbon across it will be all the way at the top and it will have a velcro closure behind the ribbon so it won't show. This is intead of the flap of fabric (tucked behind the bottle) that velcros at the bottom. It looks so much cleaner this way. It's been little changes like this that put me way behind my deadline of June 1st, but I think it will make a much better product that will sell. 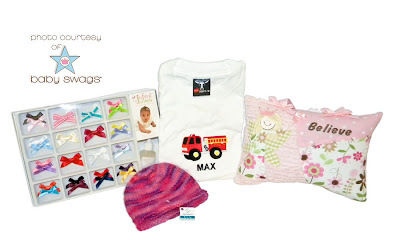 Here is an example of how to display the InfantBows Go Paks. All brick and mortar stores will get the basket for free with the purchase of 10 or more of the Go Paks. Each Go Pak will be wrapped in a clear protective sleeve and we suggest using one as a sample to open. 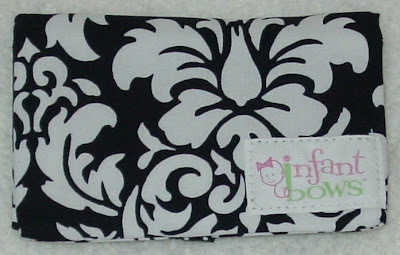 InfantBows Go Packs can be custom made with fabric exclusive to your store. 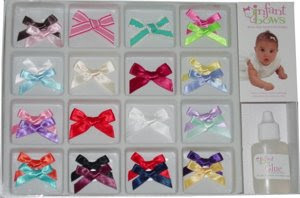 You can even have exclusive bow styles and colors. Please contact me for more information on this. Trista Sutter had a baby girl! We were so excited and honored to send her InfantBows. I will be adding a picture later today. I just got the first one and I am so excited. 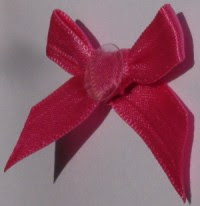 They will be listed on the InfantBows website for wholesale purchase by Tuesday, June 2nd. I am so excited! Stay tuned! This has been in the works for a very long time. New products are almost here! Hint* A classy way to take your bows with you in style. Three styles to choose from. I can't wait to share them with you so stay tuned! We are trying to get them ready and available by June 1st. (Yikes!) that is only 12 days away! InfantBows, LLC has been recognized as one of the top 200 mom-owned businesses in StartupNation’s 2009 Leading Moms In Business Competition (http://www.startupnation.com/leading-moms-2009). The competition, sponsored by VerticalResponse, recognizes the achievements of mothers across the country who run outstanding businesses. "It’s challenging for anyone to start and run a successful business – particularly in this economy. These women are setting the standard for innovation and creativity," said Janine Popick, founder and CEO of VerticalResponse. A huge Thank you for all those who voted and showed your support! It is a huge honor to be among the top 200 Mom-Owned Businesses. I am so excited to announce that our gift sets are now listed on ChicBlvd.com. This is a very classy store with lots of PR experience. Please show your support and leave a product review for others. Thank you so much. 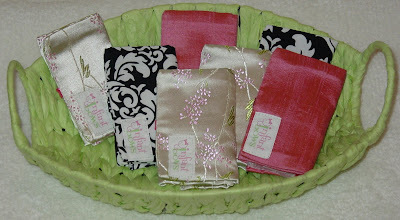 In honor of Valentine's Day, one lucky winner will receive our Sweetheart Gift set by InfantBows. 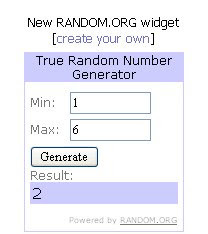 I will use a random number generator to pick a winner on February 28th at 10:00 pm central time and post it on this site. Winner will be notified via the email address listed next to their name. 1. Click on the green button "Vote for me" button and support us in this contest. 3. Winner will be posted on March 1st. An email will be sent to the winner requesting your shipping address. To enter you must be a mom and be a majority owner of a business. You must also have a website for your business. No matter what industry, what business model, what size and stage, if you meet those three requirements, you are encouraged to enter. 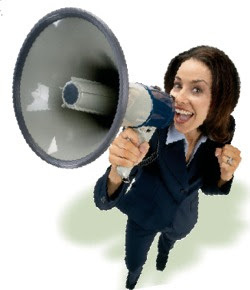 You can enter your business until midnight Pacific Time on March 31, 2009. Throughout April, winners will rank ordered according to votes accumulated. 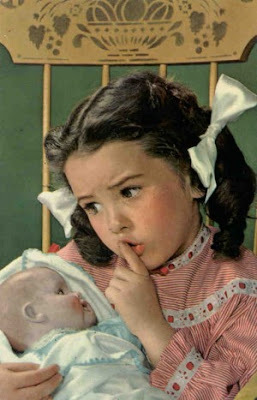 StartupNation will select a variety of moms from among the finalists and create editorial feature stories about them. Winners will be announced in early May, 2009. Congratulations to Vanessa on winning our deluxe gift set. 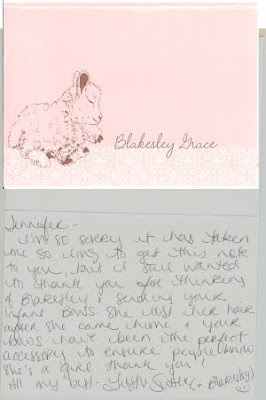 A special thank you to Heather for your review of InfantBows on your blog site, "A Day Care Life". You have a wonderful site and lots of readers! Also, Congrats to Heather on her beautiful baby girl. Now she has two girls and they are both adorable. Here is Heather with her new little addition and please notice how well she wears our InfantBows! All Work-at-Home Mother's, crafters, and small businesses can breath a little easier now. We are still in business! I think this is great news! I am thankful for the scare, as it let me as a business owner and a mother be aware of how much of our products and materials could be at risk. I have been checking every little detail on my products and will have testing sheets ready to go way before next February. As a mother, it has actually been scary to study what all has BPA and other toxic materials. I just purchased new pacifiers that are now BPA free for my two month old. His Sassy and Fisher Price toys are not BPA free. Sassy is working to get some on the shelves now. Did you know the inside liner of all our canned food has BPA? It makes me want to give up. I am still researching and will keep you posted! Enjoy the break and get back to business! I just got the spec sheets from our backing supplier. I will be posting them shortly. I wanted to make sure we comply with the new laws and we do. This is one benefit of purchasing products made in the USA. Our backings and the adhesive that holds them on our bows is lead and phylates free. Our glue is all natural, and we are working on getting spec sheets for the bottles. We are working hard to meet all new compliance requirements. We have received emails and telephone calls from many of our customers concerned about the Consumer Product Safety Improvement Act of 2008, Title I Children’s Products, specifically pertaining to the lead paint rule and timetable. We have contacted our yarn suppliers as yarn is the raw material used in our ribbon and have received material safety data sheets on our yarn and dyes used. All our yarn is manufactured domestically within the United States and does not contain harmful materials and is free from lead. The ink used on our polka dot ribbons does not contain harmful material and is free from lead. Our ribbon is free from di-(2-ethylhexyl) phthalate (DEHP), dibutyl phthalate (DBP) or benzyl butyl phhalate (BBP). February 10, 2009 thousands of children's products manufacturers and retailers will be closing their doors. I can't help but think of all the Mother's that are staying home to raise their children losing income when the economy is already struggling. This means that not only will the products created will be AGAINST THE LAW, but all the debt and loss of inventory will play a huge roll as well. I was trying to explain to my children, that if I don't find an affordable way to get my products tested, that all of my products (they help me daily with these) will be against the law. Mommy can go to jail for selling them. As crazy as this sounds, it is real. We will just make our China suppliers even bigger and hurt our Americans even more. This is the opposite of what my company stands for! I think the manufacturer of materials used like ribbons and zip lock baggies (examples of my materials) should be tested and I get a copy of their certificates and keep with my "certified products". This would be a lot more cost effective in the long run and focus on the companies with the resources to contain such certificates. I think the safety of our children should include everything in our house not just items geared for children. Material certification would be cover everything and not hurt the "little guy". Please reconsider! InfantBows plans on obeying the law and fighting till the end. I will do everything in my power to stay in the business I have worked the last 6 years for. I have invested too much time and money into this dream. Keep in touch with the latest contest, specials, and new products easier with Facebook. Add your little model to our gallery. Videos are welcome too.